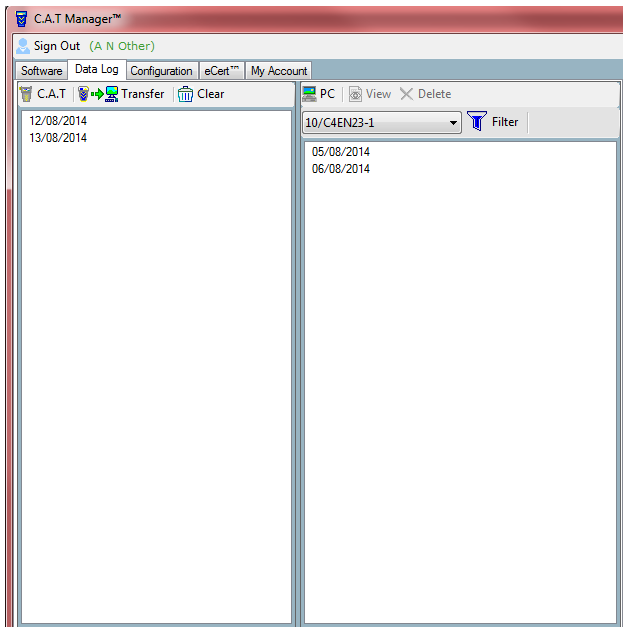 This screen allows you to upload the data logs from your C.A.T4 and store them on your PC. The left hand window shows the list of logs that exist on the C.A.T4, and which are available for transfer to the P.C. The right hand window shows all the logs which have been transferred to the PC. Transfers the list of displayed data logs from the datalogging C.A.T4 to the PC. View the selected data log(s) in the C.A.T Data Collector. Deletes the items currently selected in the PC Window from the PC. Operators can also filter serial numbers in the PC window by typing all or part of a serial number in the search box. Only those Serial Numbers which match will appear in the data window. Note: When you select the Transfer options, the entire serial number of the connected unit appears in this window. To provide enhanced security of the locate data on a C.A.T4 this command will only become available to a specific user account if that account has been enhanced to enable this feature. To do this you will need to contact Radiodetection customer support with your C.A.T Manager account details, and accept the relevant terms and conditions. Note: Before attempting to clear data logs, you will need to contact Radiodetection Customer Support to have this feature enabled.